Sometimes (well, frequently actually) I get sucked in to materials. Their various qualities zap onto something in my subconscious and I acquire them, often letting them sit in the studio for a ridiculously long time before knowing what to do with them. Often it’s a time issue because there are occasions I know exactly what I want to do with a certain material and by the time I do get around to using the thing I’m almost salivating while handling and making with it. This exact thing happened last week with three pieces of Japanese mulberry bark paper I bought late last year. First, I dyed two pieces of the (very white) paper with avocado. I wrapped about 1 kilogram of chopped avocado pips and skins in muslin and boiled the bundle in my big aluminium dye pot, with about 4 litres of water (enough to cover the bundle) for about an hour and left it overnight. Next day I heated the pot again, popped in the loose paper sheets and left them in for about 45 minutes. The result was a lovely soft, goldy-pink colour with the beautiful surface sheen of the mulberry glowing through. I’m always amazed that you get pink out of avocado but there you have it. Note the beautiful, gnarled spiderwebbiness of the bark. Looking for deeper colour I tried adding Spanish onion skins that I know can produce a very appealing rosy-pink. I really love the colour of these onions (and beetroot, which I understand is hopeless to dye with) … and purple carrots, by the way. With the uneven openness and quite firm body of the paper I knew the bunding method would be unlikely to work because it couldn’t be tightly rolled. However, I thought the result might be some pretty rosy blotches on the lighter background shown in the picture above. After bundling with rubber bands (being careful not to break the paper) I put it in the heated avocado dye pot, which now had only about two litres of dye water, simmered it for about 45 minutes, then left it to soak for a while. The result was a richer, darker, fairly evenly distributed, dusty rose-pink with a lovely unevenness due to the bark’s construction. No rosy blotches, but a happy result nonetheless. I intend to stitch with these pieces, either individually or sewn together into one larger work. 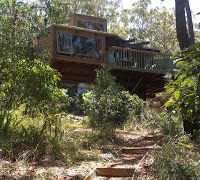 I’m looking forward to my upcoming artist residency at Gunyah from the middle of May. Research, play, writing and STUDIO TIME. Nature, self…and Pluto the velcro dog for company.